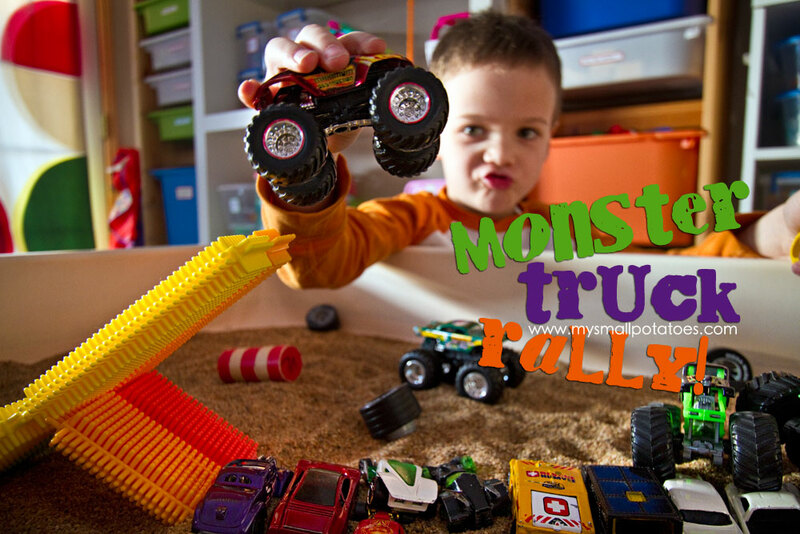 Just the other day, my littlest boy, Mr. Pancakes came to me with a request to make his own Monster Truck Rally in the sensory table. I told him if he could do it all on his own, he was more than welcome. I was still watching after the smalls and would not be able to fetch materials for him. This was just the artistic and creative freedom he was looking for. 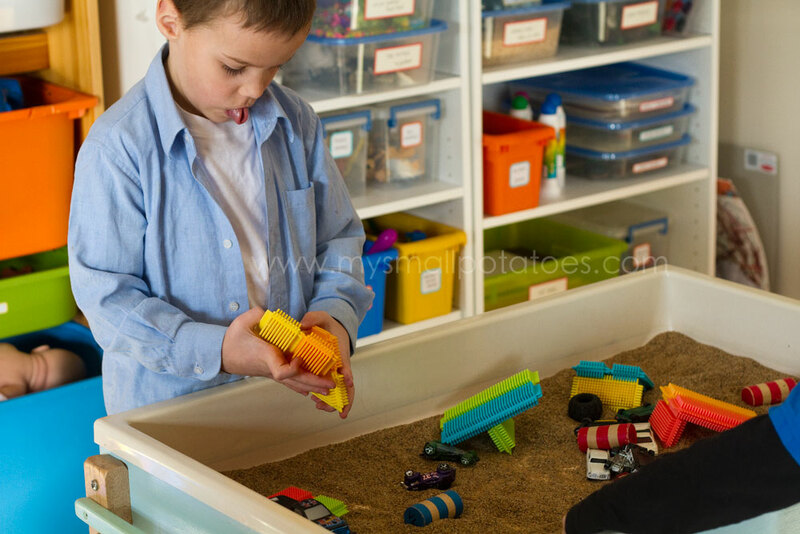 I watched him gather bits and pieces from different toy bins, the only thing he asked for was the bucket of play sand that Gramma sent home with us on our last visit. I reached the bucket for him and away he went. 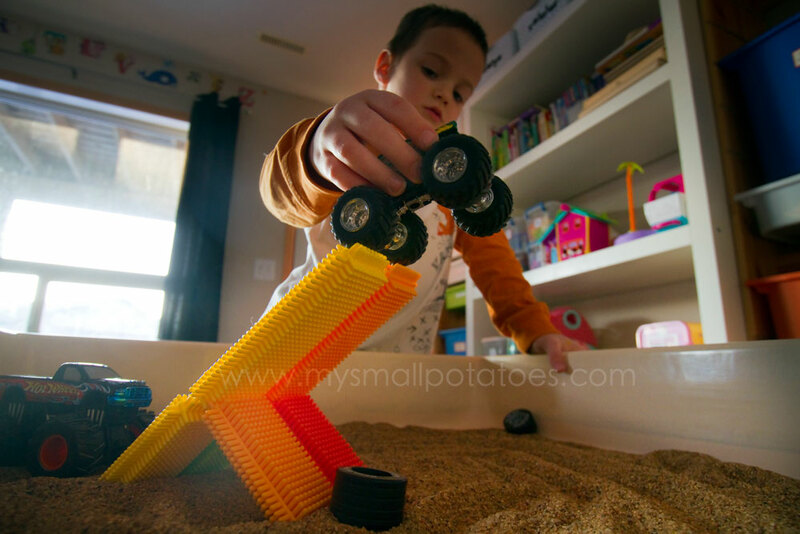 This is what he came up with … He built his jump ramps out of bristle blocks, carefully testing them out to make sure they were sturdy… He lined up his Hotwheels between the two jump ramps… And then he got down to the business of playing! 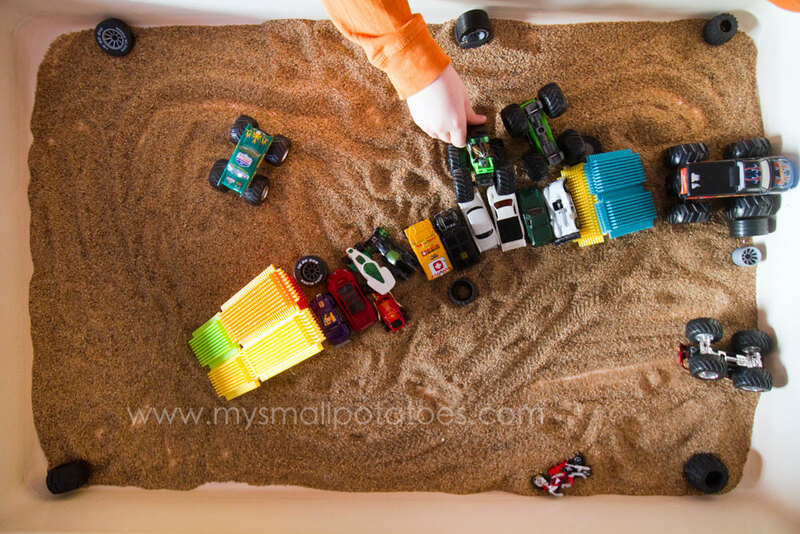 The next day afterschool when he came home, he unveiled his Monster Truck Rally to the smalls. They loved it just as much as he’d hoped! 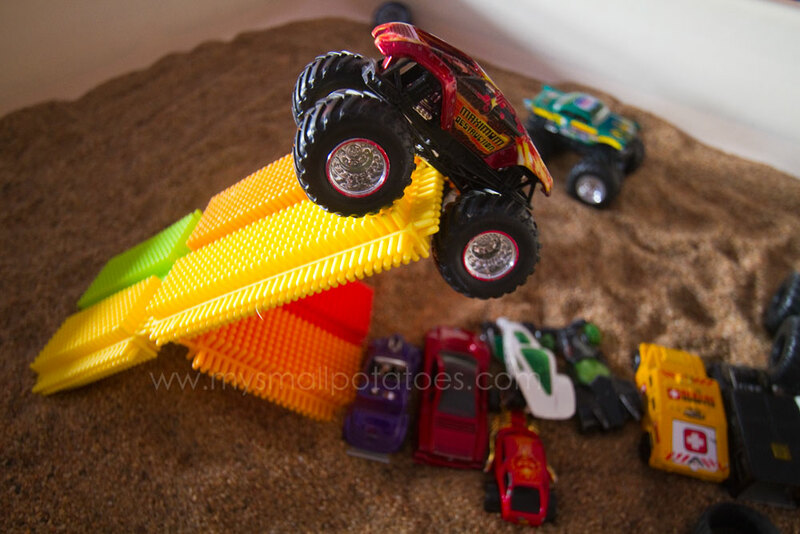 Throughout their play, Mr. Pancakes would design new ramps for the trucks to spice things up a bit… The noise in our playroom was a joyful one…albeit loud! 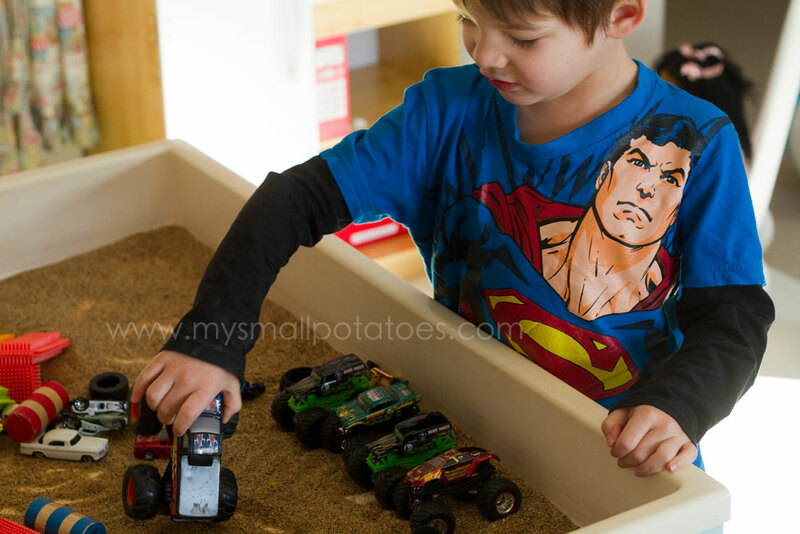 I’m a firm believer in child-directed play, and also in fostering an independent confidence in young children. My children are encouraged to clear their own plates from the table, get their own glasses of water when they are thirsty, make their own beds, put their own clean clothes away in their drawers, etc. 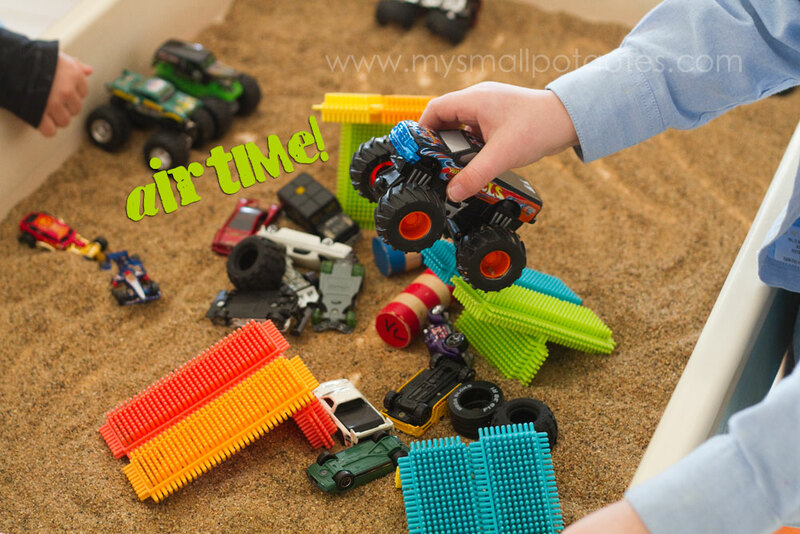 I believe that by giving children small tasks, they will experience great successes! Most importantly, I encourage freedom and independence in play time, and Mr. Pancakes was so proud of his play time creation, not to mention how pleased he was that the other children enjoyed it also. I can’t WAIT to show him this blog post! Won’t HE be chuffed!? 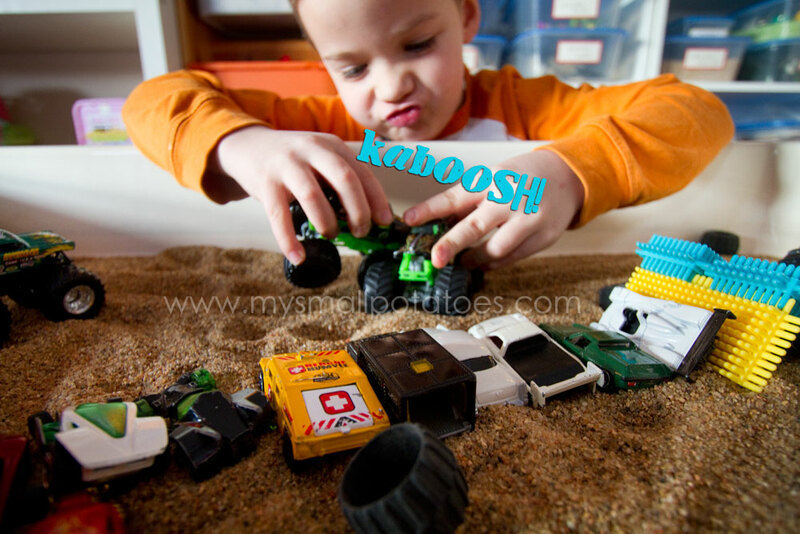 His very own post on “mama’s blog”! That’s great, and it looks like it was a lot of fun! I love that he was excited about showing it to the smalls, that is really lovely. This is so cool! My boys would love this. 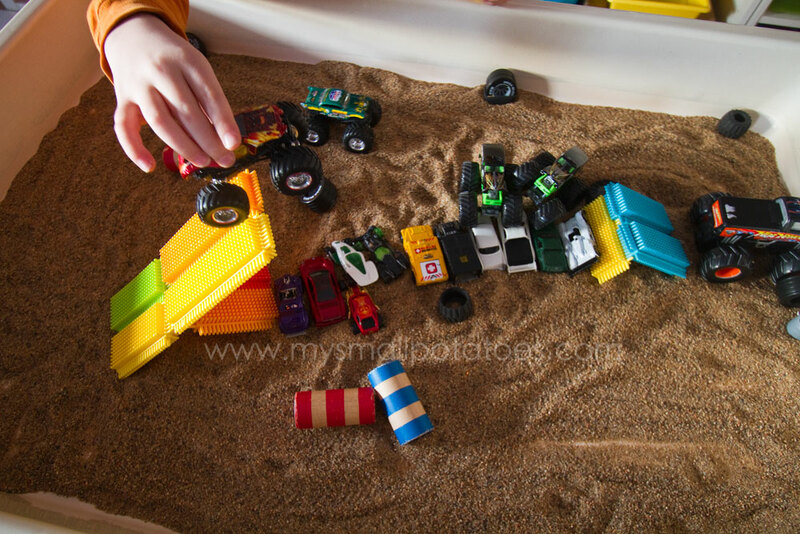 What do you have in your sensory table? Sand? It’s hard to tell from the pics. Very cool. He did it a great job!